, a distinguished poet and divine of the last century, was the son of the vicar of St. Trinity-hall in the East Riding of Yorkshire, and was born in 1725. His education, previously to his going to the university, was probably superintended by his father, whose indulgence in permitting him to follow the bent of his youthful mind towards poetry and painting, he acknowledges in an | epistolary address written in 1746. He went to Cambridge in 1742-3, and was entered of St. John’s college, where his tutor, Dr. Powell, encouraged him to publish his excellent monody to the memory of Pope, which appeared in 1747. He took his bachelor’s degree in 1745, and his master’s in 1749, but little else has been recorded of his academical progress, except that his attachment to the Muses continued during his residence at the university, of which he took leave in an ode complimentary to his college and his tutor. 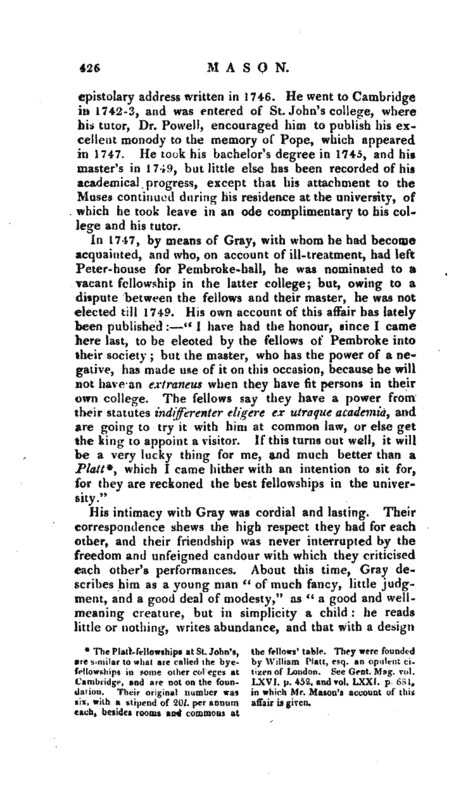 In 1747, by means of Gray, with whom he had become acquainted, and who, on account of ill-treatment, had left Peter-house for Pembroke-hall, he was nominated to a vacant fellowship in the latter college; but, owing to a dispute between the fellows and their master, he was not elected till 1749. 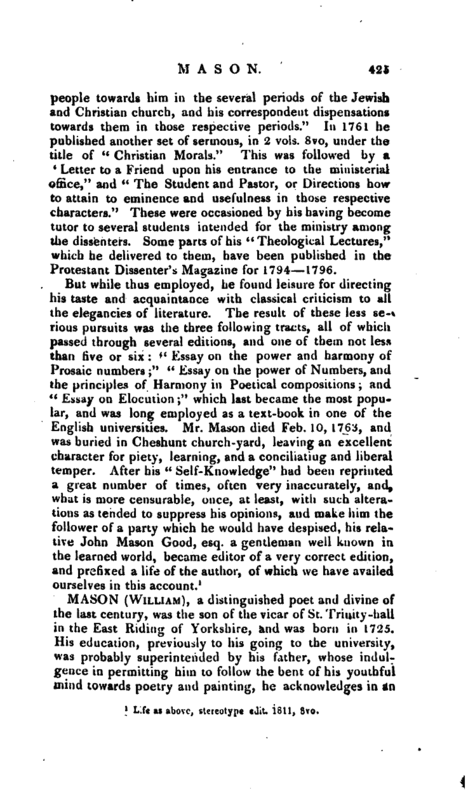 His own account of this affair has lately been published: “I have had the honour, since I came here last, to be elected by the fellows of Pembroke into their society; but the master, who has the power of a negative, has made use of it on this occasion, because he will not have an extraneus when they have fit persons in their own college. The fellows say they have a power from their statutes indijferenter eligere ex utraque academia, and are going to try it with him at common law, or else get the king to appoint a visitor. If this turns out well, it will” be a very lucky thing for me, and much better than a Platt*, which I carne hither with an intention to sit for, for they are reckoned the best fellowships in the university." are similar to what are called the bye- by William Platt, esq. an opulent cifellowships in some other colleges at tizen of London. See Gent. Mag. vol. six, with a stipend of 20Z. per annum affair is given, each, besides rooms and commons at | to make a fortune by it,“which does not, however, appear to have been the case;” a little vain, but in so harmless and comical a way that it does not offend; a little ambitious, but withal so ignorant of the world and its ways, that this does not hurt him in one’s opinion; so sincere and undisguised, that no mind with a spark of generosity would ever think of hurting him, he lies so open to injury; but so indolent, that if he cannot overcome this habit, all his good qualities will signify nothing at all." Some of these characteristics of the poetical temperament adhered to our author throughout life; others were effaced by a closer intimacy with the world. He appears to have been early attached to what he considered as the cause of freedom. Of this he gave proof in a poem entitled “Isis,” which was printed in 1748, directed chiefly against the supposed Jacobitism of Oxford. Whatever truth might be in the accusation, it had the happy effect of producing “The Triumph of Isis” by Mr. Thomas Warton, which Mason candidly allowed was a superior poem. Thus early these two writers attracted notice by the defence of their respective universities; but their generous rivalship did not end in mutual respect, for which, perhaps, the difference of political principle may in some measure account. Mason was now requested to compose an ode for the installation of the duke of Newcastle as chancellor of the university of Cambridge, in 1749, to which he does not appear to have acceded with much love of the subject. Gray thought his production “uncommonly well for such an occasion,” but the author had no pleasure in the recollection, and omitted it in his works. In 1752, he published “Elfrida,” a dramatic poem, constructed on the model of the ancients, to which he was enthusiastically attached; and having once formed the opinion that dramas might be successfully written in this way, hq persisted in it to the last, contrary to argument and experience. In the present instance he attempted the plan with certain limitations. He professed that his intention was only to follow the ancient method as far as it is probable a Greek poet, were he alive, would now do, in order to adapt himself to the genius of our times, and the character of our tragedy. How far he has executed an intention, evidently suggested by a series of conjectures, will hardly now admit of a question. All critics are agreed that “Elfrida” is neither adapted to the genius of our times, | nor to the character of our tragedy. The letters, however, which he published, may yet be perused as ingenious apologies for his judgment; and whatever the decision may be, there can be little difference of opinion respecting the merit of “Eifnda” as a poem. In 1772, Mr. Colman, at that time manager of Oo\ em-garden theatre, made such alterations as were supposed necessary to its appearance on the stage, and besides the decoration of splendid scenery, Dr. Arne contributed some characteristic iftusir-. The author, however, was so much offended at the alterations, as to have meditated a very angry address to Colman, who, on his part, threatened him with the introduction of a chorus of Grecian washerwomen in some future stage entertainment. Mr. Mason afterwards, in 1778 or 1779, made his own alterations and arrangements, and had it performed at the same theatre; but neither attempt was successful. His father died in 1753, and in 1754- he went into orders; and through the interest of the earl of “Holdernesse, whose patronage he had obtained, he was preferred to be one of the king’s chaplains, and received about the same time the living of Aston. The reputation he had acquired by the odes of his” Elfrida,“encouraged him to publish, in 1756, four compositions of that class on <c Memory, Independency, Melancholy, and the Fate of Tyranny,” which were not received with favour or kindness. Both ridicule and legitimate criticism seem to have been employed on this occasion to expose the wanton profusion of glittering epithets, and the many instances of studied alliteration scattered over these odes. Colman and Lloyd, who were now beginning to look for satirical prey, published two excellent parodies Oh one of them, and on one of Gray’s. 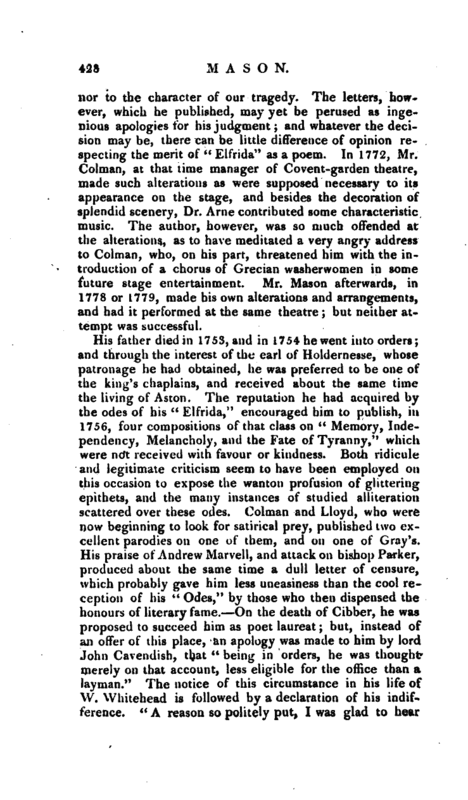 His praise of Andrew Marvell, and attack on bishop Parker, produced about the same time a dull letter of cet>sure, which probably gave him less uneasiness than the cool reception of his “Odes,” by those who then dispensed the laonours of literary fame. On the death of Gibber, he was proposed to succeed him as poet laureat; but, instead of an offer of this place, an apology was made to him by lord John Cavendish, that “being in orders, he was thought merely on that account, less eligible for the office than a layman. *’ The notice of this circumstance in his life of W. Whitehead is followed by a declaration of his indifference.” A reason so politely put, I was glad to hear | assigned; and if I had thought it a weak one, they who know me, will readily believe that I am the last man in the world who would have attempted to controvert it.“The probability, indeed^ is that Mr. Mason would not have thought himself honoured bv the situation, if compelled to fulfil its duties; for though by his mediation the office was tendered to Gray, it was” with permission to hold it as a mere sinecure." The severity exercised on his “Odes” deprived him of no fame but what he amply recovered by the publication of “Caractacus”* in 1759, another dramatic poem on the plan of the ancients, and possessing all the beauties and defects of the former, with more poetry and passion, yet with touches of nature, which, although sometimes spoiled by useless expletives, are in general just, natural, and affecting. 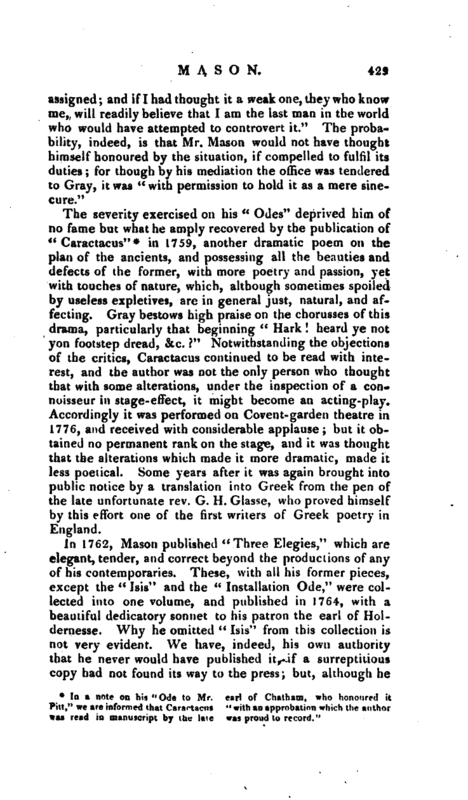 Gray bestows high praise on the chorusses of this drama, particularly that beginning “Hark heard ye not yon footstep dread, &c.” Notwithstanding the objections of the critics, Caractacus continued to be read with interest, and the author was not the only person who thought that with some alterations, under the inspection of a connoisseur in stage-effect, it might become an acting-play. Accordingly it was performed on Covent-garden theatre ia 1776, and received with considerable applause; but it obtained no permanent rank on the stage, and it was thought that the alterations which made it more dramatic, made it less poetical. Some years after it was again brought into public notice by a translation into Greek from the pen of the late unfortunate rev. G. H. Glasse, who proved himself by this effort one of the first writers of Greek poetry in England. 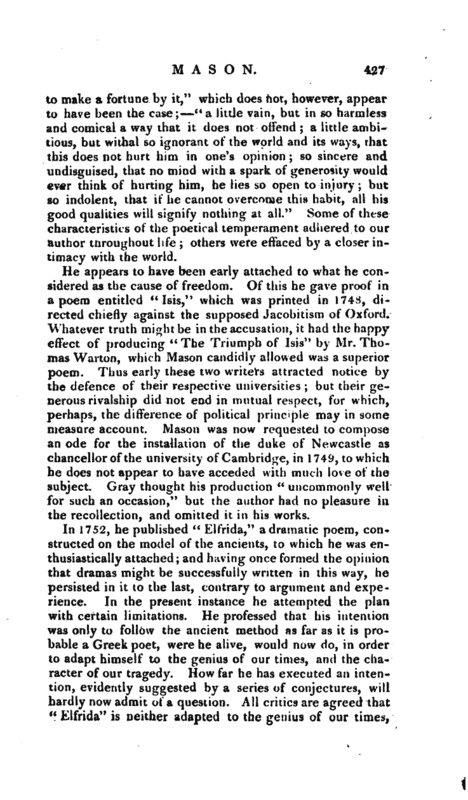 | omitted it now, he reprinted it in the third volume of his poems, published in 1796, when his sentiments on political topics were more perfectly in unison with those held at Oxford. MV. 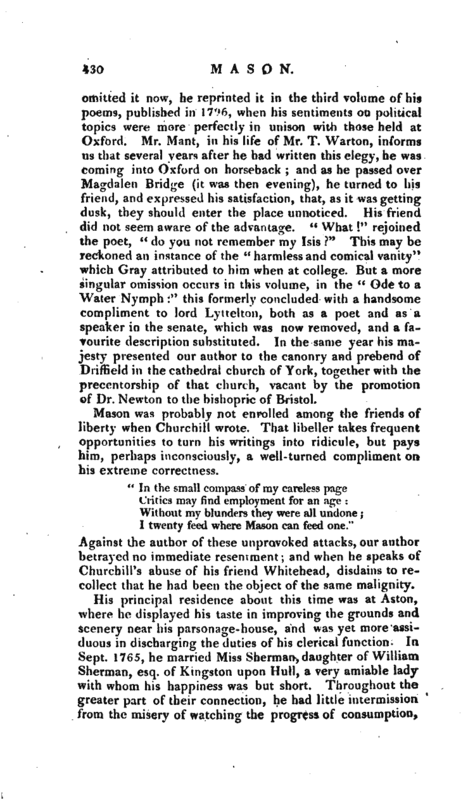 Mant, in his life of Mr. T. Warton, informs us that several years after he had written this elegy, he was coming into Oxford on horseback; and as he passed over Magdalen Bridge (it was then evening), he turned to his friend, and expressed his satisfaction, that, as it was getting dusk, they should enter the place unnoticed. His friend did not seem aware of the advantage. “What!” rejoined the poet, “do you not remember my Lsis?” This may be reckoned an instance of the “harmless and comical vanity” which Gray attributed to him when at college. But a more singular omission occurs in this volume, in the “Ode to a Water Nymph:” this formerly concluded with a handsome compliment to lord Lyttelton, both as a poet and as a speaker in the senate, which was now removed, and a favourite description substituted. In the same year his majesty presented our author to the canonry and prebend of Driffield in the cathedral church of York, together with the precentorship of that church, vacant by the promotion of Dr. Newton to the bishopric of Bristol. Mason was probably not enrolled among the friends of liberty when Churchill wrote. That libeller takes frequent opportunities to turn his writings into ridicule, but pays him, perhaps inconsciously, a well-turned compliment on his extreme correctness. I twenty feed where Mason can feed one." Against the author of these unprovoked attacks, our author betrayed no immediate resentment; and when he speaks of Churchill’s abuse of his friend Whitehead, disdains to recollect that he had been the object of the same malignity. His principal residence about this time was at Aston, where he displayed his taste in improving the grounds and scenery near his parsonage-house, and was yet more assiduous in discharging the duties of his clerical function. In Sept. 1765, he married Miss Sherman, daughter of William Sherman, esq. of Kingston upon Hull, a very amiable lady with whom his happiness was but short. Throughout the greater part of their connection, he had little intermission from the misery of watching the progress of consumption, | which terminated her life, in 1767, at Bristol, whither he had been advised to remove her in hopes of recovery. The lines he wrote on this occasion need no recommendation to a feeling heart, nor would it be easy to discover a poem, which conveys more quick sympathy, in the whole range of elegiac poetry. 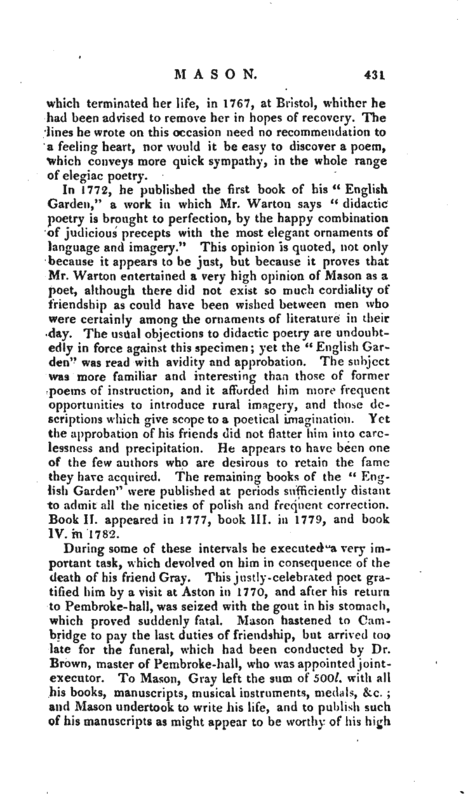 In 1772, he published the first book of his “English Garden,” a work in which Mr. Warton says “didactic poetry is brought to perfection, by the happy combination of judicious precepts with the most elegant ornaments of language and imagery.” This opinion is quoted, not only because it appears to be just, but because it proves that Mr. Warton entertained a very high opinion of Mason as a poet, although there did not exist so much cordiality of friendship as could have been wished between men who were certainly among the ornaments of literature in their day. The usual objections to didactic poetry are undoubtedly in force against this specimen; yet the “English Garden” was read with avidity and approbation. The subject was more familiar and interesting than those of former poems of instruction, and it afforded him more frequent opportunities to introduce rural imagery, and those descriptions which give scope to a poetical imagination. Yet the approbation of his friends did not flatter him into carelessness and precipitation. He appears to have been one of the few authors who are desirous to retain the fame they have acquired. The remaining books of the “English Garden” were published at periods sufficiently distant to admit all the niceties of polish and frequent correction. Book II. appeared in 1777, book III. in 1779, and book IV. in 1782. During some of these intervals he executed a very important task, which devolved on him in consequence of the death of his friend Gray. This justly-celebrated poet gratified him by a visit at Aston in 1770, and after his return to Pembroke-hall, was seized with the gout in his stomach, which proved suddenly fatal. 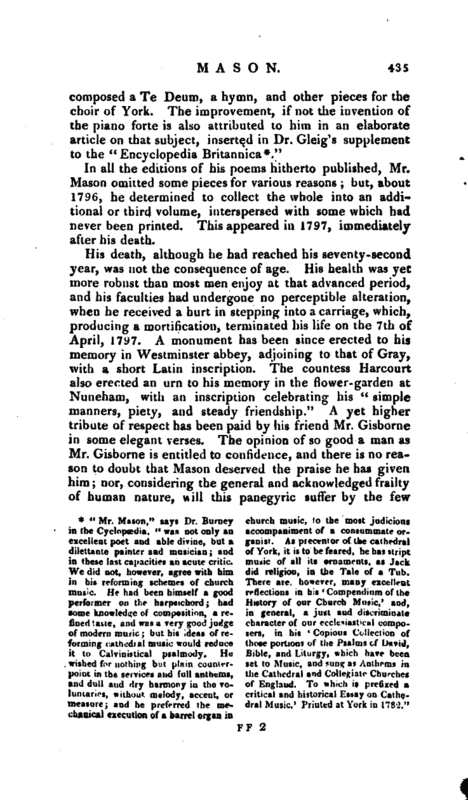 Mason hastened to Cambridge to pay the last duties of friendship, but arrived too late for the funeral, which had been conducted by Dr. Brown, master of Pembroke-hall, who was appointed jointexecutor. To Mason, Gray left the sum of 500l. with all his books, manuscripts, musical instruments, medals, &c. and Mason undertook to write his life, and to publish such of his manuscripts as might appear to be worthy of his high | character in the literary world. In his biography he chose to deviate from the usual plan, by adopting one which seemed to present more advantages. 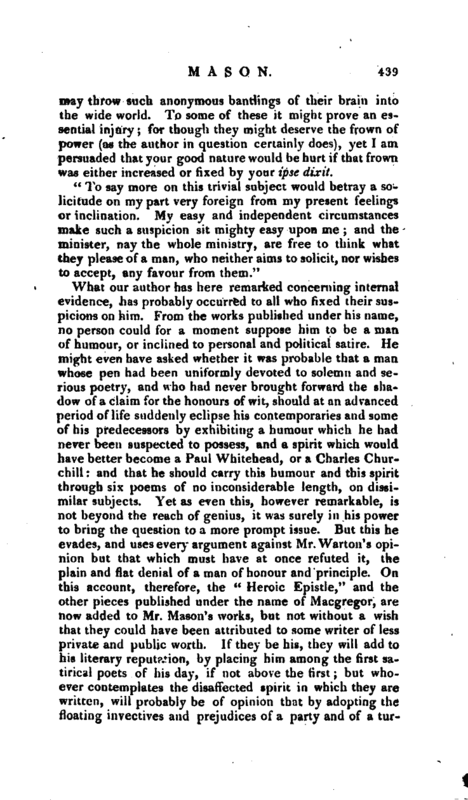 Objections have been made to it, because the biographer seldom appears either as the narrator or the critic, but it must be allowed that the whole is rendered more interesting, and that the attention of the reader being constantly fixed on the principal character, he is enabled to form a more impartial opinion than if he had perused no evidence but the assertions of the biographer. 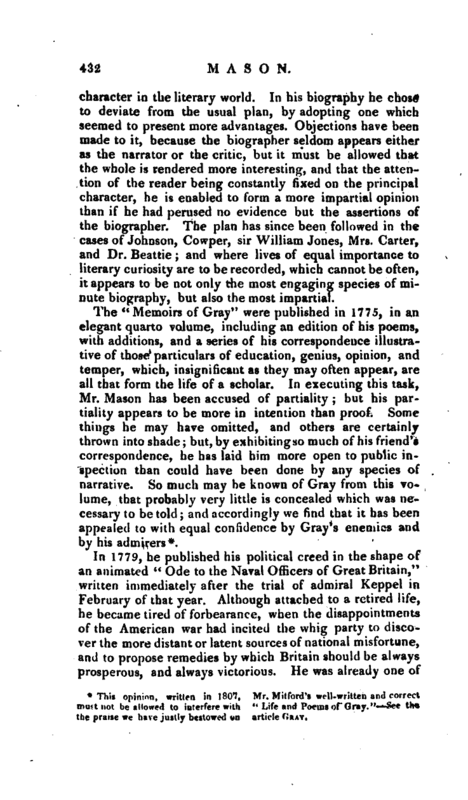 The plan has since been followed in the cases of Johnson, Cowper, sir William Jones, Mrs. Carter, and Dr. Beattie and where lives of equal importance to literary curiosity are to be recorded, which cannot be often, it appears to be not only the most engaging species of minute biography, but also the most impartial. The “Memoirs of Gray” were published in 1775, in aa elegant quarto volume, including an edition of his poems, with additions, and a series of his correspondence illustrative of those particulars of education, genius, opinion, and temper, which, insignificant as they may often appear, are all that form the life of a scholar. In executing this task, Mr. Mason has been accused of partiality; but his partiality appears to be more in intention than proof. Some things he may have omitted, and others are certainly thrown into shade; but, by exhibitingso much of his friend^ correspondence, he has laid him more open to public inspection than could have been done by any species of narrative. So much may be known of Gray from this volume, that probably very little is concealed which was necessary to be told; and accordingly we find that it has been appealed to with equal confidence by Gray’s enemies and by liis admirers*. 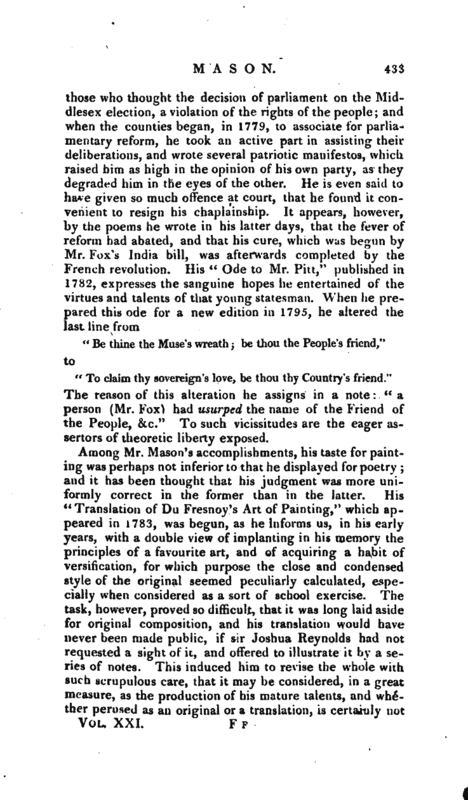 * This opinion, written in 1807, Mr. Mitford’s well-written and correct must not be allowed to interfere with “Life and Poems of Gray.” See the the praise we have justly bestowed on article Gray. The reason of this alteration he assigns in a note “a person (Mr. Fox) had usurped the name of the Friend of the People, &c.” To such vicissitudes are the eager assertors of theoretic liberty exposed. Among Mr. Mason’s accomplishments, his taste for painting was perhaps not inferior to that he displayed for poetry; and it has been thought that his judgment was more uniformly correct in the former than in the latter. 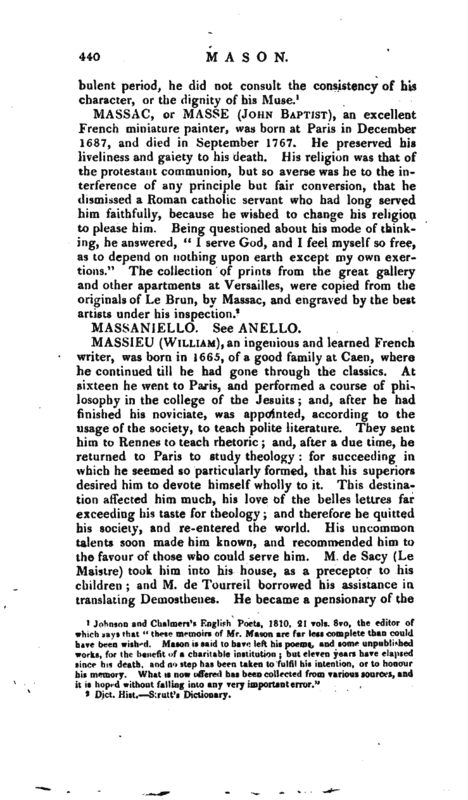 His “Translation of Du Fresnoy’s Art of Painting,” which appeared in 1783, was begun, as he informs us, in his early years, with a double view of implanting in his memory the principles of a favourite art, and of acquiring a habit of versification, for which purpose the close and condensed style of the original seemed peculiarly calculated, especially when considered as a sort of school exercise. The task, however, proved so difficult, that it was long laid aside for original composition, and his translation would have never been made public, if sir Joshua Reynolds had not requested a sight of it, and offered to illustrate it by a series of notes. This induced him to revise the whole with such scrupulous care, that it may be considered, in a great measure, as the production of his mature talents, and whether perused as an original or a translation, is certainly not | inferior to his most favourite works. In the poetical address, however, to sir Joshua Reynolds, he has not been thought so happy; and some inaccuracies of rhyme may be objected to a translation which is generally elegant and faithful. How much its value was enhanced to the artist, and to the connoisseur, by the annotations of sir Joshua Reynolds, is too obvious to be noticed. His last separate publication of the poetical kind was a “Secular Ode in Commemoration of the Glorious Revolution,” 1688, and appeared when men of all parties joined in festal meetings to celebrate the restoration and establishment of English liberty. In the same year he condescended to be the biographer and editor of the poems of his friend William Whitehead, esq. Of his life of Whitehead some notice will be taken hereafter. 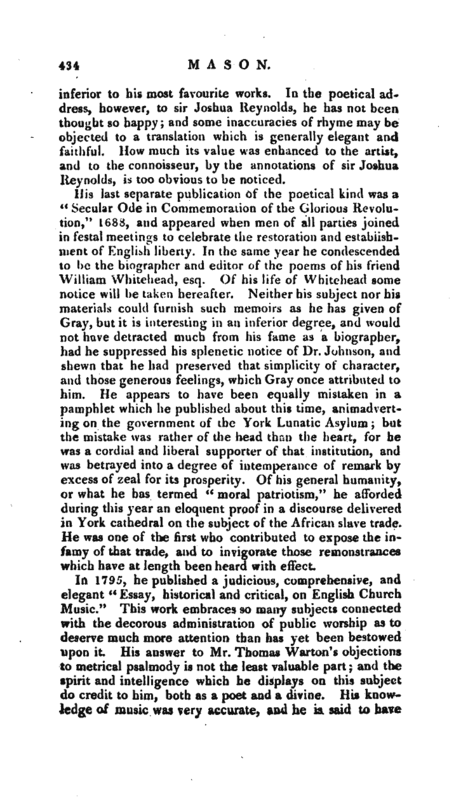 Neither his subject nor his materials could furnish such memoirs as he has given of Gray, but it is interesting in an inferior degree, and would not have detracted much from his fame as a biographer, had he suppressed his splenetic notice of Dr. Johnson, and shewn that he had preserved that simplicity of character, and those generous feelings, which Gray once attributed to him. He appears to have been equally mistaken in a pamphlet which he published about this time, animadverting on the government of the York Lunatic Asylum; but the mistake was rather of the head than the heart, for he was a cordial and liberal supporter of that institution, and was betrayed into a degree of intemperance of remark by excess of zeal for its prosperity. Of his general humanity, or what he has termed *‘ moral patriotism," he afforded during this year an eloquent proof in a discourse delivered in York cathedral on the subject of the African slave trade. He was one of the first who contributed to expose the infamy of that trade, and to invigorate those remonstrances which have at length been heard with effect. In all the editions of his poems hitherto published, Mr. Mason omitted some pieces for various reasons; but, about 1796, he determined to collect the whole into an additional or third volume, interspersed with some which had never been printed. This appeared in 1797, immediately after his death. We did not, however, agree with him did religion, in the Tale of a Tub. wished for nothing but plain counter- set to Music, and sung as Aiuhems in. luntaites, without melody, accent, or critical and historical Essay on Cathemeasure; and he preferred the me- dral Music.’ Printed at York in 1782." chanical execution of a barrel organ in | exceptions which, in truth and justice to the merits of others, his contemporaries, may be offered. Mr. Mason’s life appears to have been principally devoted to the duties of his profession, occasionally relieved by the cultivation of the fine arts. His associates, at least in the latter part of his life, were few. He had the misfortune to survive the greater number whose friendship he had cultivated in his early years, and he was not ambitious *t>f new connections. This brought on him the imputation of that pride, or distance of manner, which is ascribed to men of unsocial habits. But Mason’s heart was not inaccessible, and his friendships were inviolable. The simplicity, hdwever, attributed to him in his young days by Gray, and the patience with which lord Orford informs us, he heard his faults, did not accompany him through life. 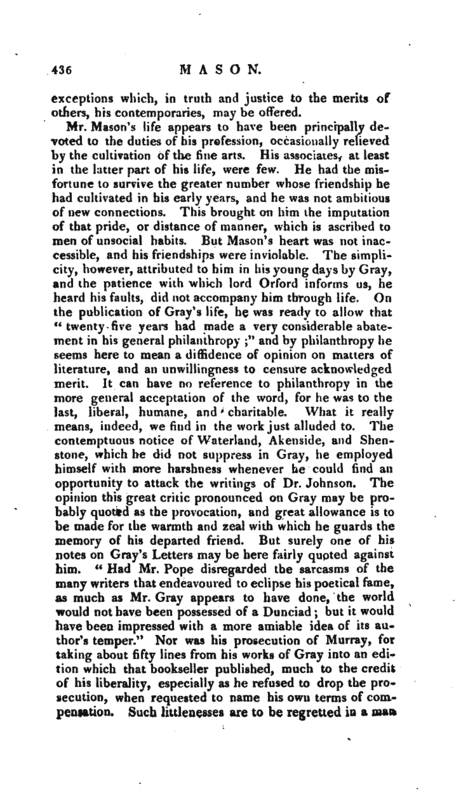 On the publication of Gray’s life, he was ready to allow that “twenty-five years had made a very considerable abatement in his general philanthropy” and by philanthropy he seems here to mean a diffidence of opinion on matters of literature, and an -unwillingness to censure acknowledged merit. It can have no reference to philanthropy in the more general acceptation of the word, for he was to the last, liberal, humane, and chai-itaWe. What it really means, indeed, we find in the work just alluded to. The contemptuous notice of Waterland, Akenside, and Shenstone, which he did not suppress in Gray, he employed himself with more harshness whenever he could find an opportunity to attack the writings of Dr. Johnson. The opinion this great critic pronounced on Gray may be probably, quoted as the provocation, and great allowance is to be made for the warmth and zeal with which he guards the memory of his departed friend. But surely one of his notes on Gray’s Letters may be here fairly quoted against him. 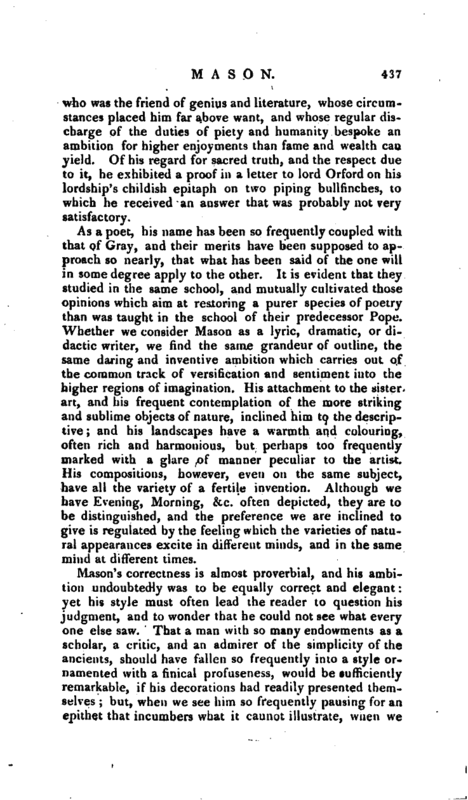 “Had Mr. Pope disregarded the sarcasms of the many writers that endeavoured to eclipse his poetical fame, as much as Mr. Gray appears to have done, the world would not have been possessed of a Dunciad; but it would have been impressed with a more amiable idea of its author’s temper.” Nor was his prosecution of Murray, for taking about fifty lines from his works of Gray into an edition which that bookseller published, much to the credit of his liberality, especially as he refused to drop the prosecution, when requested to name his own terms of compensation. Such httlenesses are to be regretted in a maa | who was the friend of genius and literature, whose circumstances placed him far above want, and whose regular discharge of the duties of piety and humanity bespoke an ambition for higher enjoyments than fame and wealth caa yield. Of his regard for sacred truth, and the respect due to it, he exhibited a proof in a letter to lord Orford on his lordship’s childish epitaph on two piping bullfinches, to which he received an answer that was probably not very satisfactory. As a poet, his name has been so frequently coupled with that of Gray, and their merits have been supposed to approach so nearly, that what has been said of the one will in some degree apply to the other. It is evident that they studied in the same school, and mutually cultivated those opinions which aim at restoring a purer species of poetry than was taught in the school of their predecessor Pope. Whether we consider Mason as a lyric, dramatic, or didactic writer, we find the same grandeur of outline, the same daring and inventive ambition which carries out of the common track of versification and sentiment into the higher regions of imagination. His attachment to the sister art, and his frequent contemplation of the more striking and sublime objects of nature, inclined him to the descriptive; and his landscapes have a warmth and colouring, often rich and harmonious, but perhaps too frequently marked with a glare of manner peculiar to the artist. His compositions, however, even on the same subject, have all the variety of a fertile invention. Although we have Evening, Morning, &c. often depicted, they are to be distinguished, and the preference we are inclined to give is regulated by the feeling which the varieties of natural appearances excite in different minds, and in the same mind at different times. Mason’s correctness is almost proverbial, and his ambition undoubtedly was to be equally correct and elegant: yet his style must often lead the reader to question his judgment, and to wonder that he could not see what every one else saw. That a man with so many endowments as a scholar, a critic, and an admirer of the simplicity of the ancients, should have fallen so frequently into a style ornamented with a finical profuseness, would be sufficiently remarkable, if his decorations had readily presented themselves; but, when we see him so frequently pausing for an epithet that incumbers what it cannot illustrate, when we | see him more attentive to novelty than strength of imagery, and above all, taxing his memory to produce repeated alliterations, we are forced to conclude that judgment is not always consistent, or that in some men it occasionally exists independent of true taste. With these exceptions, however, few indeed of the modern poets in our collections deserve a higher rank than Mason, as a lyric and descriptive poet, nor has he given any finished piece to the world from which examples of excellence may not be quoted. It is now necessary to advert to a series of poems which have been added to Mr. Mason’s works in the late edition of the English poets. The author of the “Heroic Epistle” was long concealed from the world, and for reasons which are obvious; but the poem had merit enough to be ascribed to the best living satirists, to Mason, Walpole, Hayley, Cowper, Anstey, and others. It appears, however, to be now universally given to Mason. 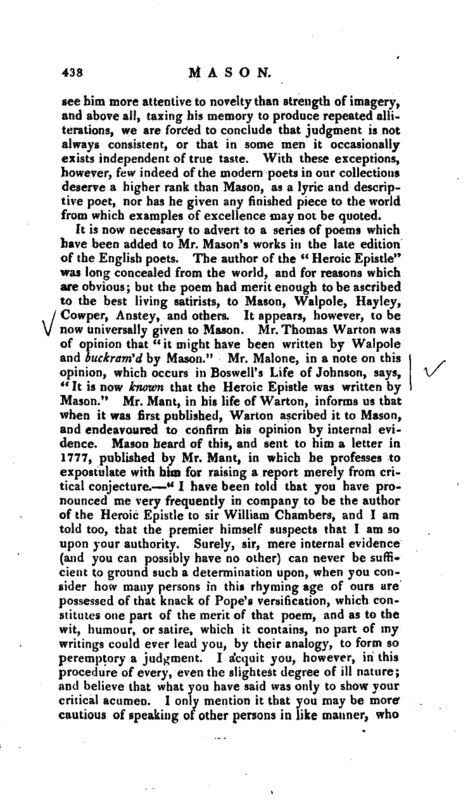 Mr. Thomas Warton was of opinion that “it might have been written by Walpole and buckram 'd by Mason.” Mr. Malone, in a note on this opinion, which occurs in Boswell’s Life of Johnson, says, “It is now known that the Heroic Epistle was written by Mason.” Mr. Mant, in his life of Warton, informs us that when it was first published, Warton ascribed it to Mason, and endeavoured to confirm his opinion by internal evidence. Mason heard of this, and sent to him a letter in 1777, published by Mr. Mant, in which he professes to expostulate with him for raising a report merely from critical conjecture. "I have been told that you have pronounced me very frequently in company to be the author of the Heroic Epistle to sir William Chambers, and I am told too, that the premier himself suspects that I am so upon your authority. Surely, sir, mere internal evidence (and you can possibly have no other) can never be sufficient to ground such a determination upon, when you consider how many persons in this rhyming age of ours are possessed of that knack of Pope’s versification, which constitutes one part of the merit of that poem, and as to the wit, humour, or satire, which it contains, no part of my writings could ever lead you, by their analogy, to form so peremptory a judgment. I acquit you, however, in this procedure of every, even the slightest degree of ill nature; and believe that what you have said was only to show your critical acumen. I only mention it that you may be more cautious of speaking of other persons in like manner, who | may throw such anonymous bantlings of their brain into the wide world. To some of these it might prove an essential injury; for though they might deserve the frown of power (as the author in question certainly does), yet I am persuaded that your good nature would be hurt if that frown was either increased or fixed by your ip$e dixit.